Having a small space to work with doesn’t mean you have to compromise on storage or style. It can be easy and inexpensive to make the most out of your apartment bathroom. It might be as simple as re-organising and adding a few basic storage solutions. All you need is an open mind, a little creative flair and these few helpful hacks to get you started. Take advantage of wall space. Take your eyes off the floor and appreciate the blank walls around you. Look high, low and all around for clever ways to get the most out of the area you have to work with. There’s nothing worse than having no room to move around so anything that can be stored up higher or even attached to a wall can be a great place to start. Don’t forget the space above your toilet. This storage area is often neglected but is such a great spot for wall shelves or shelving that fits in around it. Around the toilet shelving can be picked up from any homeware store, you can go for a basic design or invest in something that is beautiful and eye catching to double this as a statement piece and add character and depth to your small space. 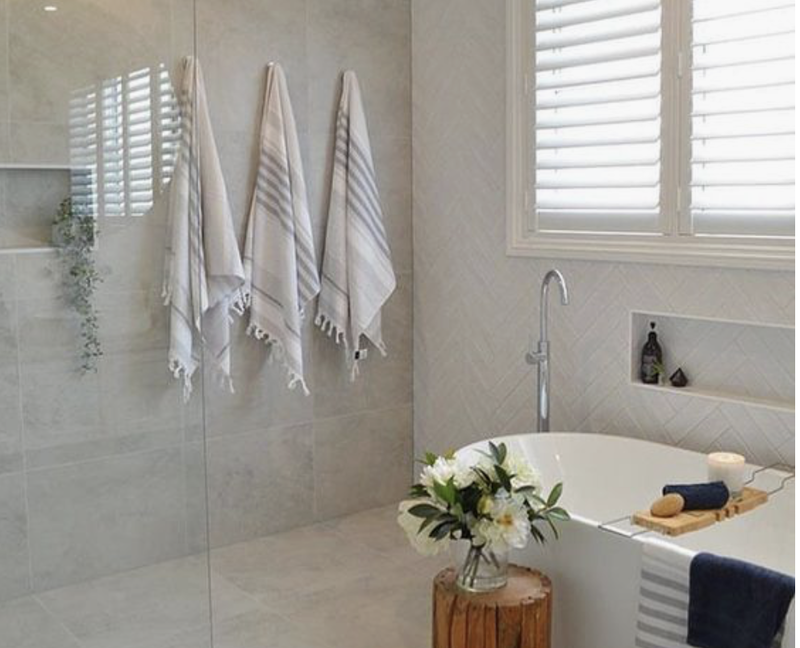 Baskets can be a great way to modernise and custom style your bathroom as well as being ultra handy and convenient. Stack them up with towels, toilet rolls and other bathroom products or be creative and attach them to the wall to create a focus piece for the room. 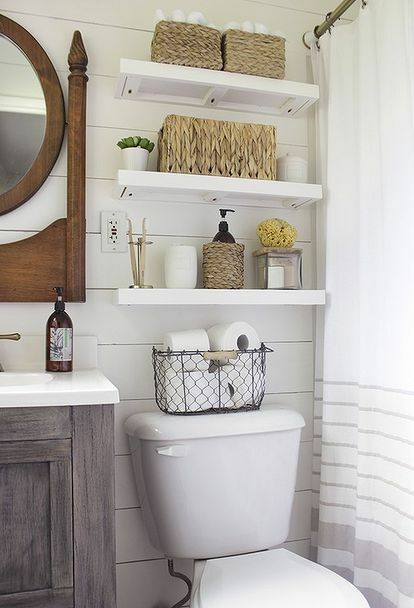 Hang your chosen style of basket above the toilet area or near your shower or bath to make for quick and easy access to hand towels and washcloths or hold body washes, shampoos and other products. This is an inexpensive way to quickly set up a storage area with a few simple everyday items. Hooks are often thought of as a tacky way to store and hang your belongings but they definitely don’t have to be. If you shop around and find a quality product they can be fancy as well as functional. You can purchase single hooks that can be spaced around at your leisure or over the door hooks for a quick fix to hang multiple towels or garments. Get rid of the rack you’re constantly running into, pick up your dressing gown from the floor and fling them over some statement hooks to organise your space. 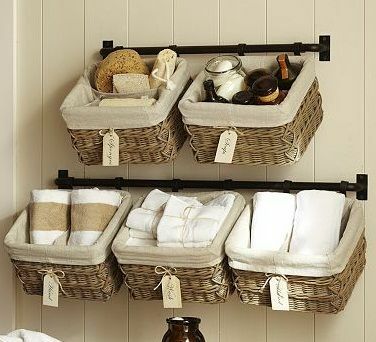 It may sound simple but shop around for the perfect shower caddy. Go for something that matches the decor, fits in the space properly and is big enough to store everything you need when you’re enjoying time in the tub. De-cluttering the bathroom can also give the illusion of more space and really utilise what little room you do have to work with. Try organising products into containers or even mason jars instead of having them strewn across the sink. This is an easy way to tidy things up and enhance the space without costing you a fortune. Only display items you use everyday to keep it minimal, clean and stylish. If you already have cabinets in your bathroom you can really make the most of them by adding over the door organisers. These are relatively cheap and allow you to maximise the space in your cabinets and organise your products more effectively. Group like items together to make mornings easy when you’re grabbing things on the go. It can be so easy to create space where you once thought there was none. Put your thinking cap on, get creative and have fun with your soon to be funky and functional apartment bathroom.